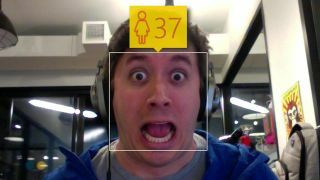 Amidst all the code talk (and there was tons during the Build 2015 Day 2 keynote), Microsoft revealed a fun/horrible new website that tells you how old you look based on various algorithms. How-old.net does what it promises: you upload a photo - of yourself, friends, family, or someone you searched for in Bing - and out pops the age it thinks the person or people in the picture are. During our tests, it was either spot on, slightly off or way off. It also gave different results for the same person, depending on the photo we uploaded. It was alternately ego crushing and flattering, to say the least. The website was born out Microsoft's Machine Learning team playing around with the firm's Face detection API and pairing it with the Bing Search API. What started out as a small test looking for 50 people to try out the site ballooned into more than 35,000 users. How-old.net primarily pulls a person's age and gender from the photo, though data like the latitude and longitude of where the picture was uploaded is also taken into account. That data is then run against data from other users on the site using Microsoft Azure streaming services. Some backend tricks later, and voilà! Out comes a result you either want to share with friends or never let see the light of day again. You can read more about the tech behind how-old.net on the Machine Learning Blog.